Metro Planning to Install Raised Vent Shafts on New Hampshire Avenue | Park View, D.C.
Metro plans to raise the vent shafts for the Georgia Avenue station currently protected by sandbags. In mid-December I reached out to Metro and asked them to remove the sandbags that are located around the vent shaft grates by the CVS and former Sweet Mango on New Hampshire Avenue. 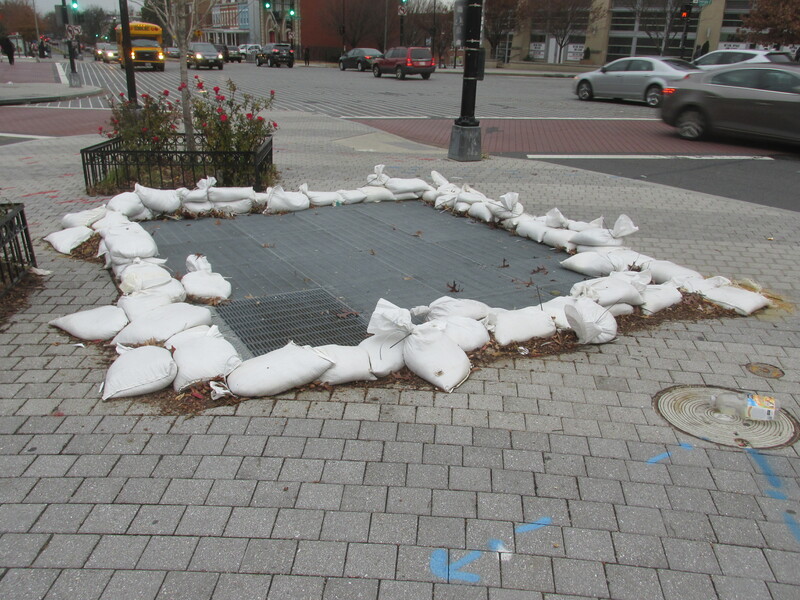 The bags were originally placed around these grates around September 30, 2016, to prevent anticipated flooding from the remnant of Hurricane Irene, an event that turned out to be over rated. Over the months, some of the bags had begun to break and spill sand, creating a mess. While WMATA originally agreed to remove the bags, they quickly followed up that there is a longer-term plan to raise the vent shafts at these two locations to prevent water intrusion and that the bags would be replaced with newer bags instead. I don’t have a date for the anticipated work, but will follow up when I do. This entry was posted on January 5, 2017 at 7:01 am and is filed under Metro, Restoration repair and maintenance. You can subscribe via RSS 2.0 feed to this post's comments. huzzah; thanks for your activism Kent. The bags are an eyesore. Speaking of that corner — when is Sweet Mango going to be redeveloped? Permits have been filed back in December to build a new structure and raze the existing building, but there is no movement on them from DCRA (e.g, approvals/denials). I give it 2 years…. There is a raised vent on the southeast corner of GA and Rock Creek Church Road, in front of the check cashing place.